← 1 Savoy cabbage, 4 great dishes……. 1 Preheat the oven 200C gas mark 6. Put the milk, stock and salmon together in a large roasting tin. Cover with foil and cook in the oven for 12 – 15 minutes until the fish is just cooked through and no longer translucent – it should break into flakes. Lift the fish onto a plate and reserve the liquid. Break the fish into large chunks, discarding any skin. Arrange over the base of a shallow 1.75litre ovenproof dish with the prawns. Wash the spinach and place in a pan with the water clinging to the leaves. Cook for 2 – 3 minutes until wilted then drain thoroughly. Add to the fish in small spoonfuls. 2 Melt 50g of the butter in a medium pan and add the flour and cook for a minute. Off the heat gradually add the cooking liquid from the fish stirring each addition in and keeping the sauce smooth. Return to the heat and bring to the boil, stirring all the time, then simmer for 5 minutes stirring occasionally. Off the heat, stir in the dill and soured cream and season with white pepper. Pour over the fish and leave to cool. 3 Cook the potatoes in two large pans of boiling water for 15 minutes until tender. Drain and mash separately, then beat the remaining butter and seasoning into the plain potato. Stir the two potatoes together but don’t over mix. Spoon over the fish to completely cover. 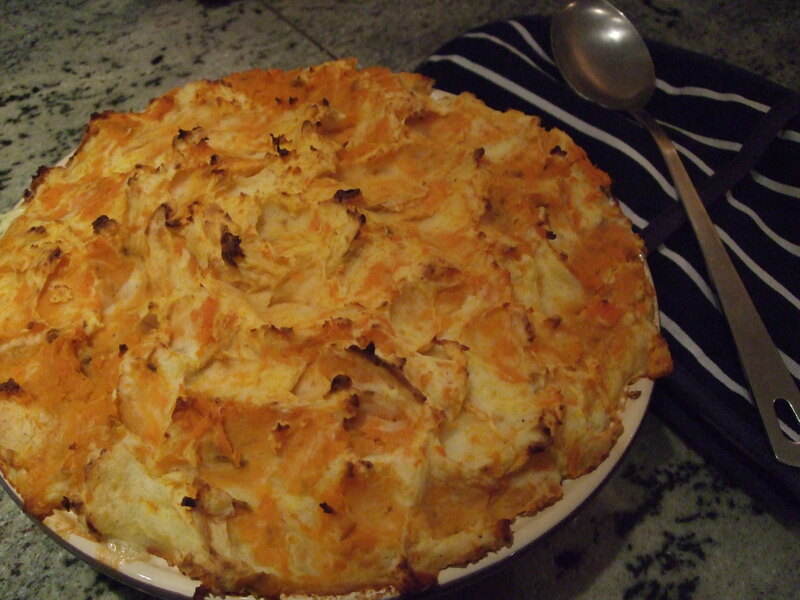 Cook the fish pie for 35 – 40 minutes until golden brown and crisp on top. Serve with steamed broccoli. I rummaged around in the fridge and found the ingredients to make this salad for lunch. 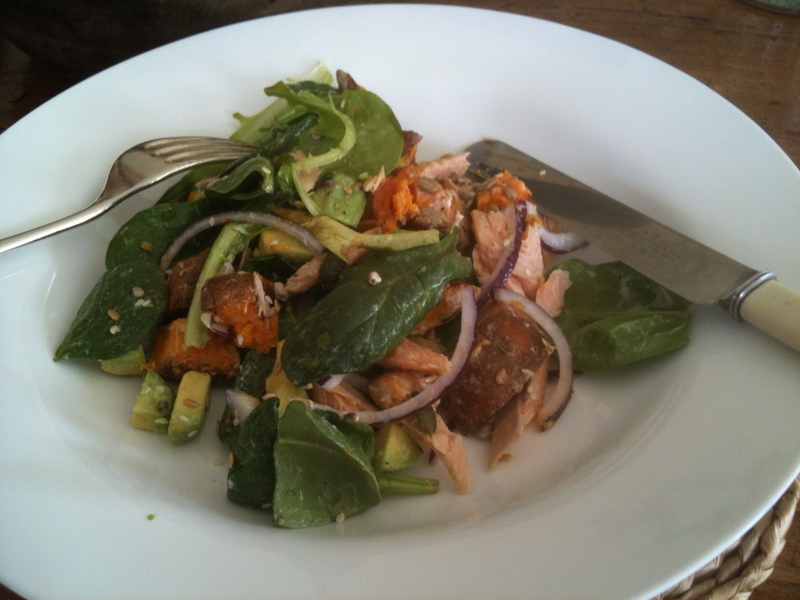 I roasted a sweet potato tossed in a little oil then cut it into cubes and tossed it in a bowl with half an avocado, some sliced red onion, flaked hot smoked salmon from Paul the fish , a tablespoon or two of mixed seeds, and the rest of my bag of spinach. The dressing was simply cold pressed rapeseed oil from Pure Kent and a little lemon juice. 1 Heat the oil in a medium saucepan and cook the garlic, onion and ginger together for 5 minutes until softened and golden. Stir in the curry paste and cook for a minute then add the tomatoes and simmer for 5 minutes to make a thick sauce, stirring occasionally. 2 Stir in the chickpeas with their liquid and bring to the boil. Simmer for 10 minutes then season and stir in the shredded spinach. 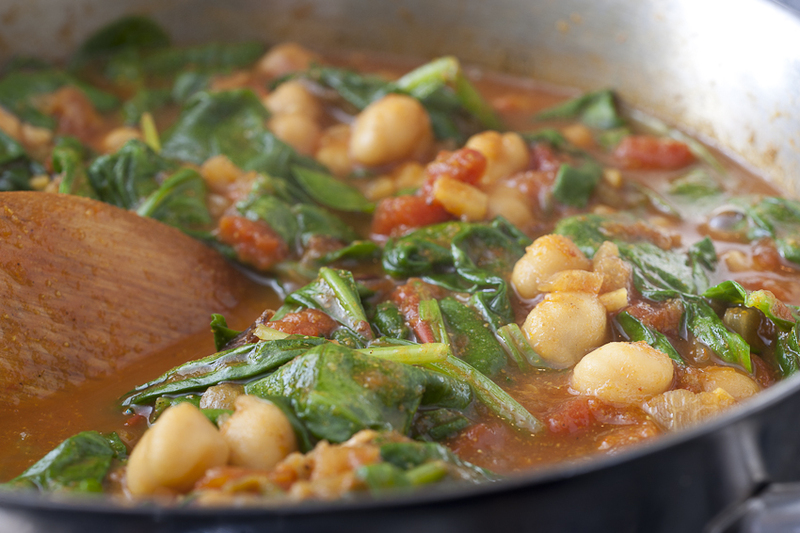 Cook gently together for a couple of minutes until the spinach is just cooked. Check seasoning and serve with a spoonful of yogurt stirred through then scatter with chopped coriander. Serve with warm naan bread. Busy mum’s lifesaver: I often make double of the base tomato sauce then freeze half the tomato sauce for future use. Just thaw and add continue as above. I use frozen leaf spinach and frozen chopped ginger and then I’ll have all the ingredients in the storecupboard! For the meat-eating contingent of the family this goes really well with chicken tikka and pilau rice. The remains of my spinach curry made a great lunch today. I reheated it with added chicken stock then roughly processed it in the pan with the hand blender. Then I dropped in a spoonful of yogurt and one of mango chutney….. 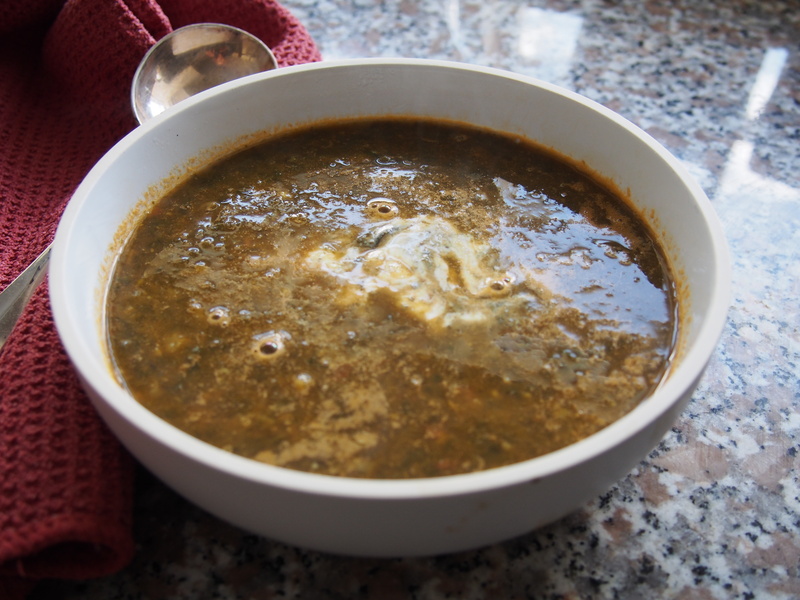 This entry was posted in In season, Recipes and tagged Quick recipes, spinach. Bookmark the permalink. Reblogged this on the PictureKitchen blog.